1. In 2 separate bowls combine the ingredients for each flavour of sausagemeat. This will make 6 Scotch eggs of each flavour. 2. Fill a medium-size pan three-quarters of the way up with water and place over a medium-high heat. Allow to come to a boil. In the meantime, prepare an iced water bath. Once the water in the pan is boiling, place 6 of the quail eggs, straight from the fridge, into the water and allow to cook for exactly 2 minutes. Remove the eggs from the boiling water using a slotted spoon and place in the iced water bath. Repeat the procedure with the other 6 eggs. 3. When the eggs are cool, peel off the shells, then wrap each egg in 40g of sausagemeat. To do this, roll the portion of sausagemeat into a ball, then flatten into a shape big enough to go around the egg. Wrap the meat around the egg and press the edges together to seal, taking care not to squash the egg inside. 4. Prepare 3 bowls – one with a small amount of seasoned plain flour, one with the beaten egg and mustard powder whisked in and one with the breadcrumbs, broken up slightly between the fingers to make it easier to coat the sausagemeat. 5. Roll the Scotch eggs in the flour, and gently tap to remove any excess, then roll in the beaten egg and finally the breadcrumbs. Place the Scotch egg back in the egg mixture and then in the breadcrumbs once again. Place in the fridge for 10 minutes. In the meantime, mix the mustard and the mayonnaise together. 6. 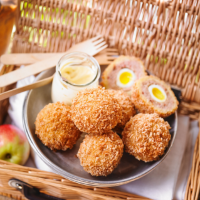 Preheat a deep-fat fryer to 190°C and fry the Scotch eggs for 2 minutes. Place the eggs on a cooling rack in a preheated 180°C, gas mark 4 oven for 4 minutes. Serve with the mustard sauce.